Mitchell College sits along the beach and waterfront of the Thames River that flows to the Long Island Sound. 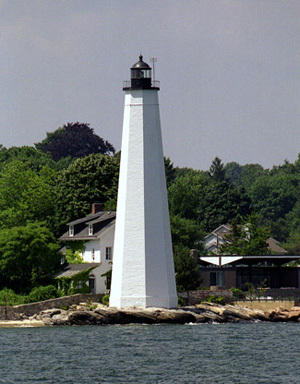 The home of its President, Janet Steinmayer, stands beside the water beneath the New London Pequot Lighthouse that also serves as the New London, Connecticut college’s symbol at the center of its seal. RCC President, Dr. Bob Musil, spoke at Mitchell as part of their new guest lecture series. Musil, who also serves as a member of the Board of Trustees and holds an honorary Doctor of Humane Letters (L.H.D.) from the college, discussed the relevance of Rachel Carson for today’s generation. Carson, Musil said, would have loved Mitchell with its quintessential New England seaside feel — complete with foggy mornings, sailboats, rocky shores, and the Pequot Lighthouse. Early in her career, Carson was inspired by the shores and lighthouses of North Carolina. 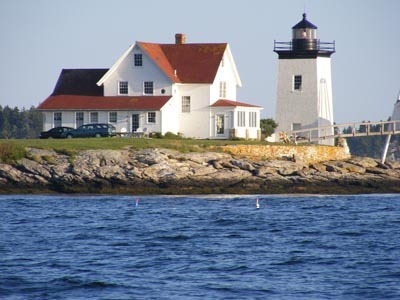 And she raised her adopted son, Roger, to love nature at her cottage along the rocky edge of the sea in Southport, Maine, near the Hendricks Head Lighthouse, where she worked on Silent Spring. Carson’s greatest relevance today, Musil said, is her environmental ethic that sees all nature as connected – all species, all human beings are worthy of love, respect, and protection. Carson, Musil explained, combines the liberal arts on the Mitchell seal – scientia et libertas – in her absolute commitment to accurate, up-to-date science and her love of literature, writing, imagination, awe and wonder. Without these Carson believed humanity would become a dangerous species, arrogant in our belief that we can control nature. The lighthouse, Musil explained, is both a symbol of light and truth, but also a warning of shoals, rocks and danger if we fail to feel for other creatures. Mitchell’s has now developed a new campus master plan that will enhance the sustainability of the campus, reorient its main buildings and views toward the shore, and add a soaring, state-of the-the art Marine Sciences and sailing building along the beach. The college has already connected Mitchell Woods more intimately to the campus while restoring its pond, replacing invasive species with native plants. When the plan is completed, Mitchell also plans expansion of its environmental studies and biology department that already collaborates with nearby centers like the Mystic Aquarium. Mitchell College has now become the 39th college to join the Rachel Carson Council Network (RCCN) and the third in Connecticut after Yale and Connecticut College.